Actual results: a Paula's Choice employee after daily use of 2% BHA Liquid (photo left) and one use of a harsh manual scrub (photo right). Daily, gentle exfoliation with a leave-on product is a complete game-changer for every skin type and skin concern. Adding this one step to your routine is the fastest, most effective way to get radiant, smooth, hydrated, blemish-free, even-toned skin. AHA (alpha hydroxy acid) and BHA (beta hydroxy acid) exfoliants help skin shed dead cells more quickly, the way it did before age and environmental factors began to slow that process. These acids are also the gentlest way to exfoliate, and they nourish and transform the look of your skin in ways no brush or scrub can. Despite the popularity of facial scrubs, most are too harsh and abrasive; they can cause tiny tears that damage skin over time, even if that damage isn’t immediately visible. Even the best scrubs, while they do have benefits, can’t produce the same results as an AHA or BHA exfoliant. For those new to the world of skincare, the hows and whys of exfoliation with leave-on products can be a bit confusing. Here we answer your most common questions with research-based answers, so you’ll have all the facts. 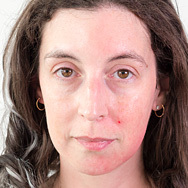 My skin doesn’t look or feel irritated after I use my scrub—are they all bad? Misconception: People often believe their skin isn’t being damaged unless it shows signs of irritation, and that scrubbing with natural ingredients can’t be harmful. But neither is true. Fact: Not all scrubs are bad for your skin, but most are. Any scrub that scratches your skin compromises its surface by leaving tiny tears; those lead to sensitivity, and, eventually, the visible signs of aging you’re trying to offset in the first place. Abrasive ingredients, even if they’re natural, can be damaging—though your skin might not show it right away. The right non-abrasive scrub with gentle, rounded beads can be a great extra cleansing step, but if a scrub feels even a tiny bit scratchy on the back of your hand, don’t use it. So scrubs are out? Acid is in? Misconception: Sometimes people believe scrubs and AHA/BHA products produce the same results. They don’t. Fact: Scrubs and AHA/BHA exfoliants serve different purposes. A well-formulated, gentle scrub or very soft brush can refine the very surface of skin and help ensure a good cleansing. But no scrub can do what AHAs and/or BHA can do: remove thick, deeper, built-up layers of dead skin, hydrate, soothe redness, even out skin tone, clear clogged pores, reduce pore size, and minimize the visible signs of aging. My skin isn't dull, dry, or uneven; why should I exfoliate? Misconception: It’s a common belief that if your skin doesn’t feel rough, there’s no need to exfoliate. Fact: Most of us can’t see or feel the dead skin cells keeping us from our freshest, most vibrant complexion. If your skin looks great without exfoliation, adding that step will make your skin even more hydrated, smooth, and radiant. And remember, there’s much more to exfoliation than sloughing dead skin; AHAs and BHA also help reduce the visible signs of sun damage, and the look of fine lines and wrinkles. How are AHAs and BHA different? How do I figure out which to use? Misconception: People sometimes think only one or the other will work for them, but that’s rarely the case. Fact: AHA and BHA exfoliants have shared and distinctive benefits: Both will smooth skin, reduce the look of fine lines and wrinkles, help even out skin tone, hydrate, and restore skin’s radiance. AHAs are more hydrating and have more research showing their effectiveness in diminishing visible signs of sun damage. BHA can help there, too, but its unique benefit is that it also works inside the pore. So if you’re prone to breakouts, bumps, redness, or clogged/enlarged pores, BHA can help. In which order should I use my exfoliant? Misconception: It’s common for people to wonder if their exfoliant will be ineffective if used in the wrong order. Fact: Apply any AHA or BHA exfoliant, regardless of texture (gel, cream, lotion, etc. ), after cleansing and toning. Follow with any serums and/or treatment products in your routine—they’re designed to work best over exfoliated skin. During the day, finish with a broad-spectrum sunscreen. At night, finish with a facial moisturizer. If you’re wondering about how to put together an essential or advanced routine, let our expert advice articles be your guide. Can I use both AHA and BHA products at the same time? Misconception: Often, people think they’re doing more for their skin by mixing AHA and BHA, but it’s not necessary to use both to get great results. Fact: You can use an AHA and BHA in your routine, but it’s also fine to stick with one or the other. If you want to use both, try using one in the morning and the other at night, or alternate days. It’s also fine to layer your exfoliants, but that tends to be too much for most people (kind of like eating an entire cake instead of just one slice). My skin is sensitive—can an acid really be gentler than a scrub? Misconception: The word “acid” isn’t generally associated with gentle results and healthy skin, so some people—especially those with sensitive skin—worry that salicylic acid (BHA) or glycolic acids (AHAs) will be irritating or sensitizing. Fact: Because your skin’s surface is naturally acidic, AHA and BHA exfoliants are naturally compatible. There’s no need to be nervous about using a well-formulated AHA or BHA exfoliant; they work gently. BHA, in particular, has soothing properties, so it helps diminish the appearance of redness. If you’ve had problems with AHA or BHA exfoliants in the past, they may have contained fragrance or sensitizing ingredients like denatured alcohol—both of which Paula’s Choice Skincare products avoid. You may have used too high a percentage of AHA or BHA, or your skin might respond better to a different “delivery system”—a gel rather than a liquid, for example. For these reasons, we offer exfoliants in a range of strengths and textures, including our CALM 1% BHA Lotion for extra-sensitive skin. Can I use my exfoliant around my eyes? Misconception: People sometimes feel nervous about using a leave-on exfoliant near their eyes. Fact: Of course you don’t want to get AHA or BHA ingredients in your eyes, but all Paula’s Choice Skincare products—including our leave-on exfoliants—are fine to apply up to the orbital bone. Apply a light layer and blend away from the eye, as products tend to migrate a bit when they warm up to body temperature. What’s the strongest percent of an AHA or BHA exfoliant I can use? Misconception: People tend to think that if a skincare ingredient is good, then more of it must be better. That’s not always the case. Fact: Our BHAs are available in varying strengths: 1% for the most sensitive skin; 2% for daily use, with three different textures to complement every skin type (Skin Perfecting 2% BHA Liquid is our cult favorite and #1 product); 4%, for those concerned about advanced signs of aging; and 9% to spot-treat stubborn imperfections. Our AHAs are also available in a range of strengths: the RESIST line offers the most focused anti-aging benefits, and a 5% AHA that pairs with RESIST Advanced Smoothing Treatment 10% AHA to create an exfoliation “power couple.” Our SKIN PERFECTING line offers an 8% AHA in gel and lotion textures. In short, there’s no “right answer” or particular percentage that’s best for everyone. Think of it like a scale, always tipped toward benefits. And keep in mind that you can combine or alternate exfoliants; many people use a lower percentage daily, and a higher percentage a few times per week to kick things up a notch. Just pay attention to how your skin responds, and adjust accordingly. I’ve heard you shouldn’t use AHAs or BHA with ingredients like retinol, niacinamide, and vitamin C; is that true? Misconception: Fashion magazines and bloggers sometimes reiterate misinformation about combining certain products. Let’s clear up the confusion. Fact: AHA and BHA exfoliants are fine to use with any other Paula’s Choice products, including those that contain retinol; they’re designed to work well together. And, contrary to what you may have read, retinol does not exfoliate skin. Some people experience flaking from retinol, but that’s a sign that their skin isn’t tolerating the product well, not that it’s being exfoliated. Again, you shouldn’t see or feel any unwanted signs of exfoliation from AHA or BHA products, just their great results. Where does the dead skin and pore-clogging stuff actually go? Misconception: Sometimes people think an exfoliant isn’t working unless they can see their skin peeling or flaking. But you shouldn’t see (or feel) a thing. Fact: AHA and BHA exfoliants work imperceptibly, loosening the bonds that hold dead, dull skin to the surface, so it sheds more quickly—the way it once did naturally. BHA is oil soluble and has the added benefit of unclogging pores, so oil flows easily to skin’s surface, where it and the “gunk” inside pores are easily washed away. Now that you’re up to speed on the basics, what are you waiting for? Find the right exfoliants to work into your routine!